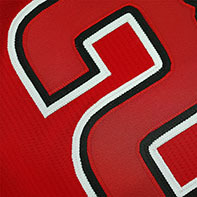 Numbers are silk screened directly onto garments using ink and then cured using heat. 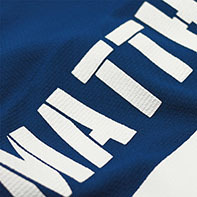 Names are silk screened directly onto garments using ink and then cured using heat. 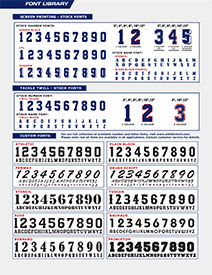 Polyester twill fabric numbers cut and sewn onto garments. 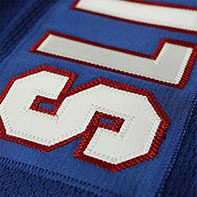 Player names made up of individual letters cut out of polyester twill fabric and sewn onto twill nameplates and then sewn onto garments. 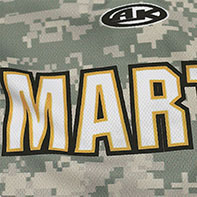 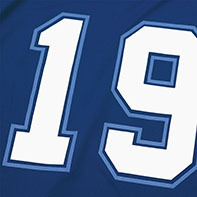 SIZES: 3", 4", 6", 8", 10", 12"
Numbers transferred directly onto garments by using digital dye sublimation transfer process. 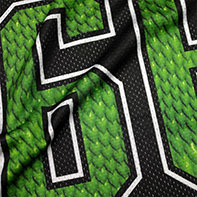 Player names transferred directly onto garments by using dye sublimation transfer process.